A pretty silly movie that is occasionally kind of cute or fun, but never very smart. The setting and little details are fantastic here, but unfortunately these are the only good things about the movie. It’s a movie about the management of a toy factory, and that’s a fine setup until we start meeting the characters and seeing how one-dimensional they all are. The plot is really simple-minded as a new owner is given the reigns to the toy factory and suddenly turns it into a military production assembly line. a movie like this needed to have a director with a dark vision. Tim Burton would have been perfect. The way it is, however, the movie really just continues to play it safe. Toys are not a very smart movie. There’s no question about it, the movie is artistic and visually pleasant, but as far as story goes, there really isn’t much there. Maybe that’s because the characters are all cardboard cutouts of real people with no actual depth. We don’t get the slightest bit into the psychology or mindset of any of these characters. We don’t even learn anything interesting or new about them during the course of the movie. And yet, there is plenty to like about this film on a very basic, surface level. The movie is about a toy factory where the owner is dying and instead of leaving the place to his children, who live and work there, he decides to leave it to his older brother. That brother, The General, is a military man who has no time for toys or childish things, but doesn’t take long to realize that he can use the toy factory to make weapons for the military. He cans even train kids to be tank drivers and shoot down enemies by using videogames to help them train. 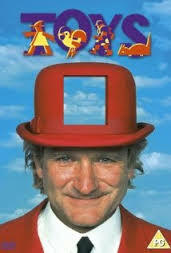 Robin Williams plays Leslie, the main character of the movie, who is the son of the dying man. For some strange reason we don’t really see Leslie and his father together at all, and the father doesn’t leave the toy factory to his son. Was there a rift between them, or a good reason why the father didn’t trust Leslie? We are never told the answer. Instead, it seems to be kept under the surface, that there is something wrong with Leslie, and that if we keep watching, we will find out what it is. Unfortunately, we never do. Instead, we just watch him and his sister, Alsatia (Joan Cusack) go from place to place around the factory, smiling and laughing about everything. That’s when The General shows up and takes things over. It seems like The General isn’t sure if he wants the job at first, but once he sees what he can do with the toys and how he can use them for something he is interested in, he quickly changes his tune. While we learn very little about Leslie and his relationship with his father, we do learn a good bit about some of the other characters. Alsatia, for example, dresses up like the Barbies that her father’s company makes, so that she can experience exactly what it’s like to wear those clothes and have those hairstyles. There are some very creepy things here, and this is one of them. The movie doesn’t explore those themes enough, and if someone like Tim Burton made this same film, it could have really been a thing of excellence. Something like the scenes of Edward Scisshorhands with his maker, made into a whole movie. Some scenes in the movie do work better than others. There is a pretty cool think tank scene where Leslie and a group of toy makers are discussing different kinds of fake vomit when suddenly the walls start closing in on them. Soon full on Tetris-like pieces for popping out of the walls, and they have to crawl up onto the counter where they were working just to avoid getting crushed. There are lots of artistic moments like this that show off the movie’s vision. When we meet the father, for example, he is in a tent that looks like the military. We later pull back to realize that he set the tent up himself in the middle of his living room, like something a child might do. Similarly, Alsatia lives in a dollhouse; only it is part of a bigger picture and strategically placed in the center of her bedroom. The plot to the movie is very simple and weak. At the end it isn’t even humans or main characters that are fighting, but the toys. The humans hide behind things, start the toys up, and let them go after each other. It’s a dopey ending, on par with pretty much the way most of the movie has gone. 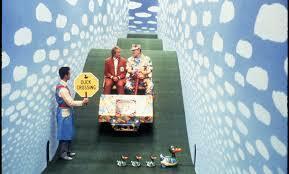 Toys is a movie with fantastic atmosphere and settings, but a very generic and uninteresting story. The premise is cool only in that it sets the movie inside a toy factory at the management level. Other than that, however, the plot about a malicious man who wants to brainwash kids with the toys is just silly. I definitely would have liked to see this movie in the hands of a director who wasn’t afraid to get dark with the material. Toys is not the movie that it could have been. Instead of going for extreme laughs, the movie plays it safe and gives us the usual plot placed in a pretty cool setting.